Hundreds of elite graduates of Moscow’s illustrious MGIMO traveled from 32 countries to rub shoulders and reconnect in Baku. 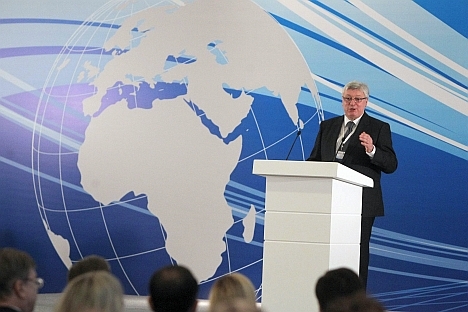 When Henry Kissinger spoke of Moscow State Institute of International Relations (known as MGIMO), he dubbed the school “Russia’s Harvard.” The prestigious institute - the alma mater of top ministers in countries as diverse as Japan and Slovakia - held its first international alumni reunion from April 11-13 in Azerbaijan’s capital of Baku. President Ilham Aliyev just happens to be a graduate. He received his doctorate in history from the institute in 1985. RBTH spoke to MGIMO’s longtime Rector Anatoly Torkunov, a former diplomat, about the forum of global influencers. Russia Beyond The Headlines: Why did you decide to hold such a gathering? Anatoly Torkunov: The event’s slogan was “Together into the future.” The point was to relive some of our best memories from college and meet friends we hadn’t seen for a long time. It was also great for networking: our guests included Vietnamese Deputy Foreign Minister Nguyen Phuong Nga, Slovak Deputy Prime Minister Miroslav Lajcak. The meeting was important for enhancing our university’s international profile, which is becoming increasingly important in our globalized world. We also decided to have our own “mini-Davos” and used the venue to discuss global trends in education, the development of civil society, energy – we were in Azerbaijan, after all – and ecology. It was an honor to have Azerbaijan’s President Ilham Aliyev – who is also a MGIMO graduate – open and close the talks and deliver a personal message from Vladimir Putin on the importance of such alumni gatherings in strengthening international relations. RBTH: Can you name some of the other the attendees? A.T. : Deputy Prime Minister of Ukraine Konstantin Grishenko attended, as well as the Deputy Defense Minister of Mongolia. Among the Russian attendees were Culture Minister Vladimir Midinsky, former Duma Foreign Affairs Committee Head Konstantin Kosachev and Sergei Cheremin from Moscow City Hall. It was interesting to have alumni of very different ages coming together: we had some Chinese graduates from the early 1950s, with a much younger cohort coming from some other counties. In Japan and South Korea, many of our alumni are middle-aged and occupy professorships and top spots in their respective foreign ministries. There was also a large French delegation. In total we had 450 alumni from 32 countries. RBTH: Why did you choose Baku for the first gathering? A.T. : Our alumni had been discussing such a gathering for some time, so the initiative from the Azerbaijani chapter didn’t come spontaneously. We were looking at capital cities like Moscow and Sofia that are home to many of our graduates and ended up choosing Baku. Will you continue this meeting as a tradition in future years? Next year we celebrate the University’s 70th anniversary, so we’ll likely have a gathering in Moscow. Slovak Deputy Prime Minister Lajcak has suggested holding the meeting in Bratislava, while the Bulgarian alumni are eager to host us in Sofia. Azerbaijan’s president suggested making it an annual tradition in Baku. RBTH: Do you still have a high percentage of international students? A.T. : Yes – about 20 percent of our student body is international, heralding from 57 countries. In the United States, we cooperate very actively with Georgetown and John’s Hopkins universities.